Movie "Seasons" - "Les Saisons"
What happens when you hit a table with your hand? Phonon creation and propagation. You provide mechanical energy that is propagated in the table as a vibrational wave or sound wave (you actually start a sound wave). A specific quantity, a quantum of this is termed a phonon. So the action of your hand results in the propagation of phonons. b. amorphus solids, which have an a random structure. Given these forces, the crystal lattice can be modelled as a system of balls connected/coupled with springs oscillating with frequency ω (cf. natural frequency of a system). Coupled atomic vibrations generate a traveling wave with displacements along the atom chain (longitudinal) or perpendicular to it (transverse). What is the frequency of vibration (ω) in a solid? Note that if a solid has two or more kinds atoms then this has two solutions, two branches. "In the case of the long-wave approximation in acoustic branch of the dispersion curve the atoms move synchronously and deviation of every atom is about the same; in optical branch the atoms move in antiphase. For the shortest waves in acoustic branch the lighter atoms are still and more heavy atoms oscillate; in the optical branch the situation is inverse." If the solid has one kind of atoms, their vibrations would be somehow “in phase”. As mentioned by wikipedia “if the displacement is in the direction of propagation, then in some areas the atoms will be closer, in others farther apart, as in a sound wave in air”. This would be the “acoustic branch”, the “acoustic phonons”. 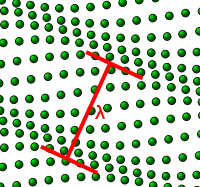 If the solid consists of two kind of atoms, then we would observe out-of-phase movements of the atoms in the lattice, one atom moving to the left, and its neighbour to the right. This kind of behaviour can also be induced by electromagnetic radiation; if for instance we shine infrared light on a sodium chloride crystal then the sodium and chloride lattices will vibrate against each other. Since this crystal behavior can be induced by electromagnetic radiation, which includes an optically perceived area, the related branch is termed “optical branch” and we have the “optical phonons”. In theory, at the temperature of absolute zero, the atoms of a crystal have their lowest energy and are still. As (thermal) energy is added the atoms will vibrate (move back and forth or oscillate) around a specific position. Imagine a child on a swing that asks you to push it in order to go faster, and this while you are infront of the swing. When are you supposed to push the swing? After it reaches the top of its trajectory. It makes no sense to push it down while it goes up. The system will not gain kinetic energy in this way. It appears that there is a specific way in which you can contribute energy to a system to increase its energy; the system will gain energy only at specific positions/ways of swing pushing. You somehow have to follow the rythm of the system, to resonate with the system in order to increase its energy. Quantum mechanics says that crystal solids will gain or loose energy only in specific quantities. In a classical mechanical oscillator, you can dump in as much energy as you want; the energy content is proportional to the square of the amplitude of the oscillation, and that can be varied continuously. In a quantum mechanical oscillator of frequency f, the energy content of that oscillator can only take on discrete values, (n + 1/2)hf, where n is a nonnegative integer. This is a subtle yet hugely important distinction. Mathematically it explains a major contribution to the heat capacity of crystalline solids at low temperatures (and it's very strongly related to the form of blackbody radiation when one is worrying about photons rather than phonons). Excerpt: "In practice, most materials are filled with a chaotic mix of phonons that have different frequencies and are traveling in different directions, all superimposed on each other, in the same way that the seemingly chaotic movements of a choppy sea can (theoretically) be untangled to reveal a variety of superimposed waveforms of different frequencies and directions." "If an atomic vibration is somehow initiated at one end of a solid body, the vibrations will spread throughout the rest of the crystal. One can thus say that we created some (probably many) phonons at the point of excitation, and that these travelled—in a particle-like manner, if we so wish—to other locations in the material, where we later detect them by noticing that the lattice is now vibrating there. The process just described may represent sound propagation or heat transport in the material." The atoms of a crystalline solid form a regular lattice structure, which can be likened to an array of balls connected by springs, the springs representing forces between neighbouring atoms. Such structures can vibrate mechanically in various ways, either because of thermal motion or some external force. A sound wave travelling through a solid is an example of the latter. Quantum mechanics tells us that these vibrations can only gain or lose energy in discrete amounts and these are called 'phonons', by analogy with photons for light. Under ordinary conditions there is an enormous number of phonons or photons present and we do not see this 'graininess'. However, careful experiments confirm the picture. University of Cambridge. Includes animation.